Barium hydroxide are chemical compounds with the chemical formula Ba(OH)2(H2O)x. When reacting with carbon dioxide it gives barium carbonate. Barium hydroxide can be prepared by dissolving barium oxide (BaO) in water. It crystallizes as the octahydrate, which converts to the monohydrate when heating with air. It’s a corrosive and toxic compound and has a strong bases and its water soluble. Barium hydroxide is used in organic synthesis as a strong base agent. It decomposes to barium oxide when heated to 800 °C. It is used as the precursor to other barium compounds. Barium hydroxide is used in analytical chemistry for the titration of organic acids. 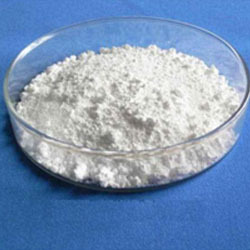 Used in the manufacture of Barium chemicals. Used in the production of photographic paper for printing. Used in analytical chemistry for the titration oif weak organic acids.